Even though Penny Dreadful is ostensibly Eva Green's show, as its plot centers on the supernatural trials and tribulations of her tortured Vanessa Ives, it still functions structurally as an ensemble. Throughout its first two seasons, series creator and writer John Logan has gone to great lengths to balance the needs of the series' overarching plot involving Vanessa's true nature and the designs certain characters have for her – i.e., Lucifer and now Dracula – while also attending to the various plot threads of Sir Malcolm Murray, Ethan Chandler, Dr. Frankenstein, and the harrowing second life of his creation the Creature, or John Clare as he has taken for his new moniker. It has been an impressive feat so far, one that has teased higher and higher stakes with each subsequent go-round, and managed to grant seemingly ancillary characters like Dorian Gray and Lily (née Brona) their own propulsive plotlines that finally came into their own with the ambitious season 3. This season was ambitious for several reasons. Not only did it give a face and a name to Vanessa's torment – one that managed to make the inclusion of Dracula feel weighty and significant and not just a clever bit of monster marketing – but also for the way in which the story flung its characters far and wide, spreading them out over the globe without losing the sense that they are still and will always be connected. 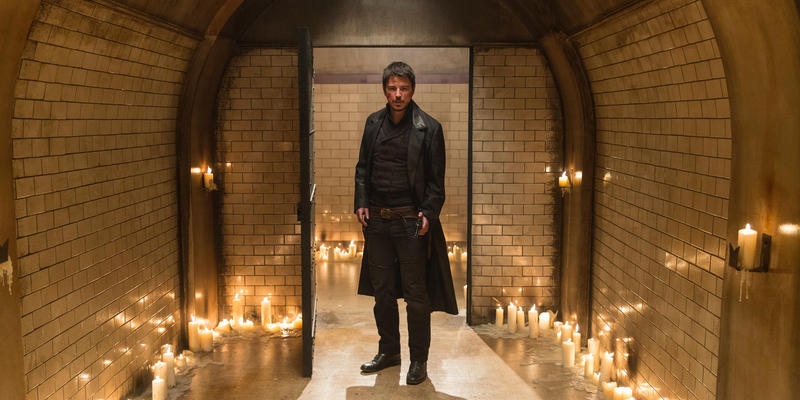 With Sir Malcom and Kaetenay chasing after Ethan and Hecate in New Mexico, Penny Dreadful reestablished two primary characters' roles, underlining Malcolm's importance as a father figure to both Vanessa and Ethan, while also furthering the importance of Ethan's lycanthropy as it pertains to the Vanessa's future. At the same time, the series doubled down on its wonderfully feminist ideals, by shifting the man-as-monster focus from John Clare to that of his creator, as he and Dr. Jekyll attempt to tame and domesticate the liberated (and therefore, dangerous) Lily. In all, though, the main crux of the season has been on Vanessa's understanding of who she is and the slow seduction of Dracula and the darkness he could bring about as her willing servant. As last week's antepenultimate episode intimated, dark things are coming to an already murky world, one where Vanessa may find herself an even greater threat to her friends and the world than even she could imagine. That is where the two-hour finale begins – with the beginning of the end as it were – as the unholy union between Dracula and Vanessa has brought out all the night creatures and filled London with a poisonous fog that's chokes the life out of the city's residents by the thousands. It's a grim scenario, one that justifies the propulsive nature of both 'Perpetual Night' and 'The Blessed Dark.' But while Vanessa serves as the driving force for the end of days, she barely makes her presence known in either installment. Perhaps there is a reason for that, as the change in Vanessa escalates the sense of evil that has always surrounded her and now literally surrounds everyone. So, in a sense, the circumstance in which Ethan, Sir Malcolm, and the others find themselves is like walking a mile in Ms. Ives' shoes. While Penny Dreadful succeeds in building tension with dense fog, hordes of rats and frogs crawling around everywhere, and Dracula's minions doing battle with what is humanity's last hope, the absence of Eva Green in the last two hours deprives the character and her plight of much of its intended significance as it pertained to the stakes of the narrative at hand. From the first season on, endings have never been a particular strong suit of Penny Dreadful. The series' season finales have often felt rushed and perfunctory, especially after the episodes that revel in grand narrative gestures like 'Possession' or even this season's emotionally stirring 'A Blade of Grass'. And yet, the balance between Penny Dreadful's need for bloody action and its sweeping appreciation of the tragedy of its characters sometimes fail to match up evenly across the board. Given the size of the board, though, it's still impressive that Logan, more often than not, managed to find some poetic resonance within his characters, and especially within this dark, romantic pastiche of classic monsters. This was made particularly evident by the focus the final two hours placed on Dr. Frankenstein, Lily, and Dorian Gray. The monologue given to Billie Piper about owning the pain and anger of Lily's past and the loss of a child is some of the best work Piper has done in the series; it demonstrates her range as well as Logan's ability to explore the nature of identity and humanity in two deeply flawed, monstrous characters. The same is true of Jon Clare, who had gone from being an obnoxious and entitled creature to a shattered man made whole by the recovery of his family. The two threads mirror one another to such a degree that you might think one would prove superfluous, but that's not the case. Instead, they both serve to underline the season's final moment with Dorian, a man who has lived so long he can no longer find the passion in anything. If there's a common thread running through Penny Dreadful, this is it: the notion that life's passions are what make living worthwhile. And while that concept brings universality to the narrative, it does so in a way that also dilutes the nature of what Lily's season 3 storyline seemed to have been building toward. That doesn't make the moments any less powerful on an emotional level, especially as Lily, Dorian, and the Creature find themselves looking at eternity through very different eyes. But after all that attention is lavished upon them, there is little room to do the same for Dracula and Vanessa. After all the foreplay throughout the season, the slow seduction of Vanessa by Dracula, there's never any sense of what their union means to either of them. Dracula is compelled to protect their relationship and to claim her for himself when faced with doing battle against Ethan, Sir Malcolm and the rest, but what about Vanessa? Logan makes good use of Dracula's discovery that Ethan Chandler – the Wolf of God – is at his doorstep and Vanessa's slow withdrawal of her hand from his shoulder as recognition of the situation's overwhelming sense of inevitability. But without seeing what Vanessa and Dracula's relationship was like and what it meant to either of them beyond its function in terms of the larger narrative, the climax of the battle with Dracula and Vanessa's own undoing by Ethan's hand felt disconnected by the deliberateness of the sequence's staging. As this is now confirmed to be the series finale, 'Perpetual Night' and 'The Blessed Dark' would have been better served by a few additional scenes in which the importance of Vanessa's character could be reasserted, so that her death would have the impact it deserved. Vanessa's death was shocking, but perhaps not quite as shocking as THE END being shown as the screen faded to black. Logan had said previously that he saw the series as a three-season arc, but as is usually the case with television, it felt as though there was be room for more should he choose to carry on. And considering this is a show where resurrection and immorality are baked right in, there was no reason to think Vanessa's end was permanent. The real surprise, then, is in the verification that the series has come to a close and that Vanessa's torment has finally ceased. And so, fittingly, Penny Dreadful finds an end that places the romanticism of the characters' tragic nature ahead of everything else, ending the series as the season began, with poetry and with death. Penny Dreadful seasons 1, 2, & 3 are available on Showtime.